Before beginning any exercise program of weight loss, consult your health care practitioner. Keep out of reach of children. Maltodextrin, Dextrose, Citric Acid, Malic Acid, Natural And Artificial Flavors, Sucralose, FD&C Red #40 FD&C Blue #1. JetMASS™ can be consumed on non-training days to maintain creatine and repair processes in the body. Mix JetMASS™ with ice or cold water. JetMASS™ works great on a light to empty stomach. Mix 1-2 scoops of JetMASS™ with 8 to 10 ounces of water or your favorite beverage. Consume immediately after workouts and before bedtime. JetMASS™ can be used as a stand alone product or stacked together along with JetFUSE™ NOX prior to any type of athletic event or workout. JetMASS by GAT is your #1 Choice for Post-Workout German Creatine! JetMASS is designed to: Expand muscle fiber size, increase muscle building strength, Increase muscle cell production, Optimize recovery time, and Maximize anabolic growth inducability. 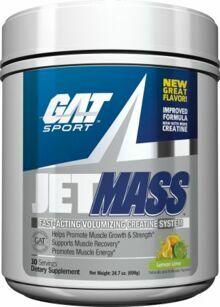 JetMASS is hands down Best-in-Class for Creatine Size/Strength Formulas. When you’re competing, reach for some JetMASS by GAT. Stack on Gains Real Fast with JetMASS Premium Post-Workout and Nighttime Protocol by GAT. JetMASS is the most powerful, super-dosed, Anabolic German Creatine System! And JetMASS tastes awesome! It’s the Ultimate 1-2 Punch! Take JetFUSE NOX before training, for the most insane workouts, tearing muscles completely down, with muscle pumps and psycho-vasodilation. Then consume JetMASS after training for total muscle cell volumization, peak ATP, muscle fiber repair, and maximizing of anabolic growth inducability. Both formulas are extremely low sugar, very low in carbohydrates, and are great for Pre-Contest, Bodybuilding, Martial Arts, high-output sports, and other intense activities. Black Cherry This is a Buy 1 Get 1 FREE offer!